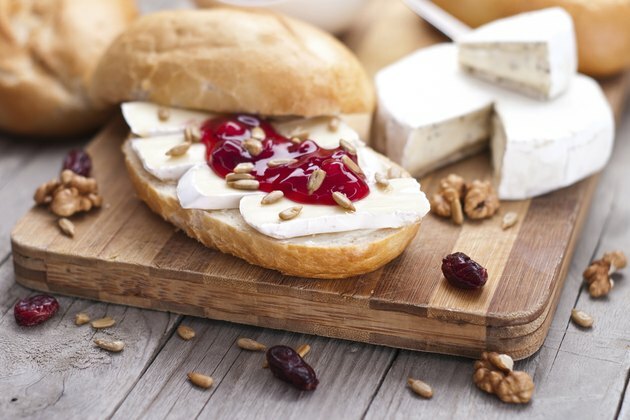 Brie baked with preserves can be served for either an appetizer or dessert course and makes an eye-catching presentation for any dinner party or special occasion. Brie's mild flavor seamlessly partners with almost any fruit or nut combination, allowing you to experiment with a variety of combinations to suit your party's theme or the season. Baked Brie can be used to showcase your homemade preserves, either at your own gathering or when given as a hostess gift. Slice the top surface of the rind of the Brie off, leaving the rind on the sides and bottom of the wheel intact. Spread raspberry, apricot, fig or the preserves of your choice over the exposed cheese surface. Sprinkle the preserves with chopped pecans, almonds, walnuts or the nuts of your choice, if you wish. Place the wheel of Brie onto a baking sheet. Bake the Brie in the center of the oven for eight to 10 minutes or until the cheese is soft and warmed all the way through. If you need to test, you can carefully insert a knife into the center of the Brie to check for softness. The jam will close over and cover up your incision, preserving the presentation of your cheese wheel. Serve with sliced fruit, crackers or crusty bread. Slice the top surface of the Brie's rind off, leaving the rind on the sides and bottom of the wheel intact. Unroll a sheet of puff pastry onto your baking sheet and place the decorated Brie wheel into the center of the sheet of pastry. Lay a second sheet of puff pastry over the top of the Brie and press the edges of the pastry sheets together to seal them. Trim the excess pastry away, leaving just enough to completely seal the Brie entirely. Use a fork to beat the egg with 1 tbsp. water to make an egg wash.
Brush the exposed surfaces, not the bottom, of the pastry-wrapped Brie with egg wash.
Bake the wrapped Brie in the center of the oven for 25 minutes, or until the pastry turns golden-brown. Serve with sliced fruit or crackers.